This footed pan grate is a great addition to any food pan collection. 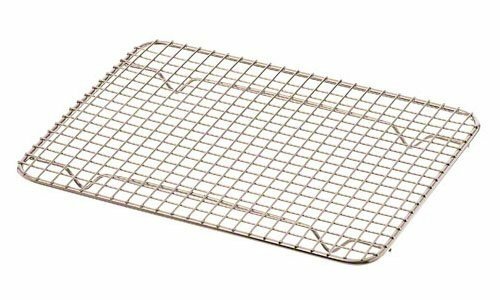 It is nickel-plated wire mesh grate which keeps food from sticking to pan. It serves as a great tool for raising foods above the bottom of the pan to prevent them from sitting in juices or sticking to the bottom of the pan. This pan grate is also footed for better stability. Keep your meats and other delicious foods from getting soggy with this fabulous pan grate. This grate fits 1/2 pan. Measures 8-inch width by 10-inch length by 7/8-inch height.